Snap off and discard the ends of the asparagus, and cut the rest of the stalks diagonally into roughly 2.5cm pieces. Finely slice the ginger, garlic and roughly chop 1 spring onion. Finely slice the remaining spring onion and set it aside to be used as a final garnish, if desired. Mix the sauce ingredients together in a separate bowl. 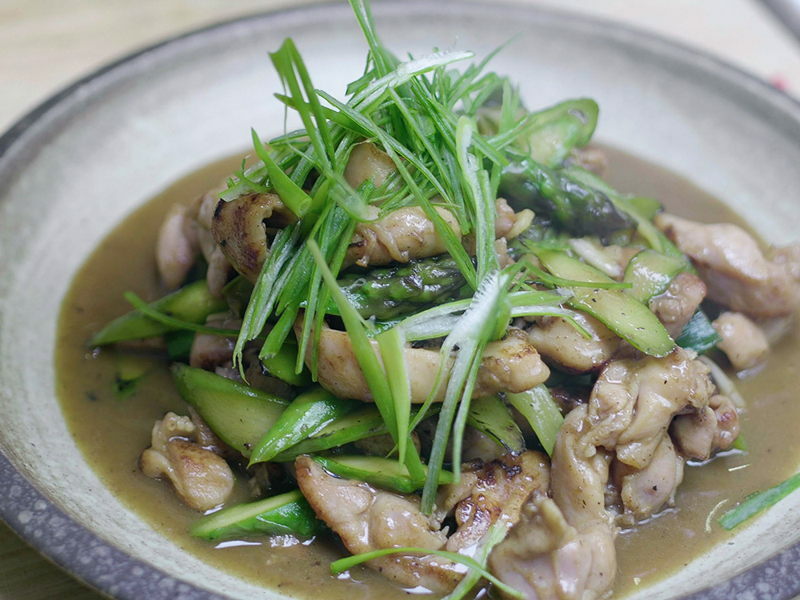 Build your wok clock: place your chopped asparagus at 12 o’clock, then arrange the ginger, garlic, roughly chopped spring onion, chicken bowl, and sauce bowl clockwise around your plate. Add the asparagus into your wok, continually stirring for 30 seconds. Then push the asparagus to one side of the wok and, in the space created, introduce a dash of vegetable oil along with the garlic, ginger and roughly chopped spring onion. Stir-fry for 30 seconds until slightly softened, then fold the asparagus back over the top and through. Stir-fry the whole mixture together for a further 2 minutes, until the asparagus is just tender and lightly coloured. Transfer the ingredients from the wok to a bowl and set aside. Add a further 1 tablespoon of oil to the wok and return to smoking point before then adding the chicken. Push the chicken down into the wok with the back of a spoon in order to sear it on one side, then fold your chicken over to sear the other - you should see a golden brown, charred colour develop on both. Stir-fry for 3–5 minutes until cooked through and golden brown on all sides. Return the vegetables to the wok, pour over the sauce and bring to a vigorous boil. Cook for a further 30 seconds, until the sauce is silky-smooth (we don’t like gloop!). Transfer to a large dish, scatter over the finely sliced spring onion and serve.